Have you ever wondered whether people actually have experienced miracles and the protection of God in life and death situations? Have you ever wondered whether prayers are answered when the answers to those prayers could only have come from the intervention by a loving God? Have you ever wondered if God is real and cares about us very much? 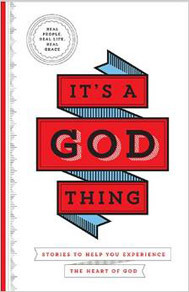 “It’s A God Thing”, is a collection of stories by real people who have experienced God’s protection, comfort, healing, provision, and everyday miracles. It is a collection of 42 real life events in which people have experienced the love of God – those moments in time that have no explanation for what has happened except for some intervention by a caring God. Real people. Real Life. Real Grace. A new start after a colossal failure. Reconciliation with a son that had stormed out of the house years ago. Complete recovery when the doctors said there was nothing else they could do. A broken marriage restored. A moment of absolute joy, even when storms were raging all around. Big moments. Small Moments. My story, “Angels on Duty”, was one of those stories selected to be in this book. It’s a story about a time many years ago when I was attacked in my home by an intruder. My husband was at work – the kids were sound asleep upstairs. The intervention by God’s angel was real. I share this story to let people know that God does hear whispered prayers, gives us the strength we need in any situation and the power to follow through. This is a book about those special moments in life when the only explanation for what has happened – protection, joy, forgiveness, reconciliation, healing or a fresh start is something that God brought about. “It’s A God Thing, Stories to help you experience the heart of God,” by Freeman-Smith, published by Worthy Inspired , 2013, is available at Amazon.com. Just click on the link below.